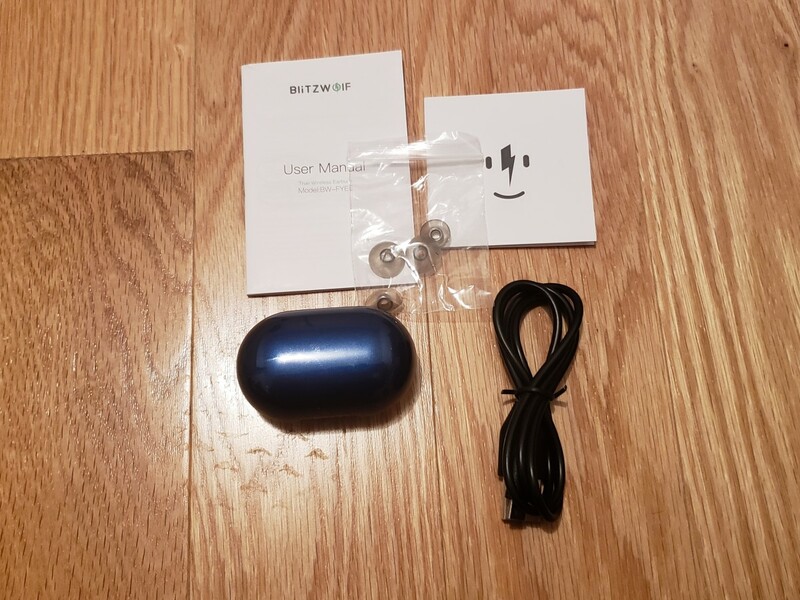 It's been quite some time since my last review of BlitzWolf's original true wireless earbuds. The original BW-FYE1 wireless earbuds admittedly put comfort over style, but that has all changed with their latest release. 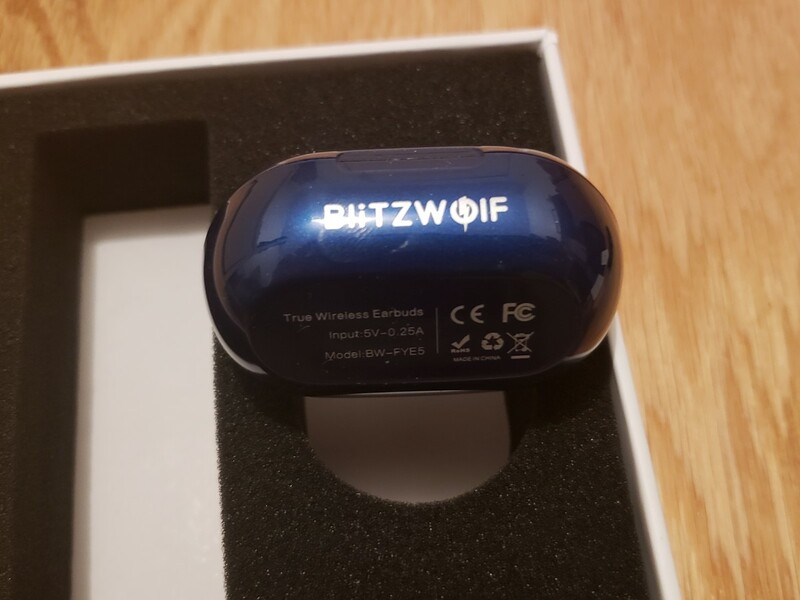 The current BlitzWolf BW-FYE5 true wireless earbuds feature significant visual and technical improvements. Today, we will be taking a closer look as to what these improvements are to ultimately determine if they are worth the upgrade. 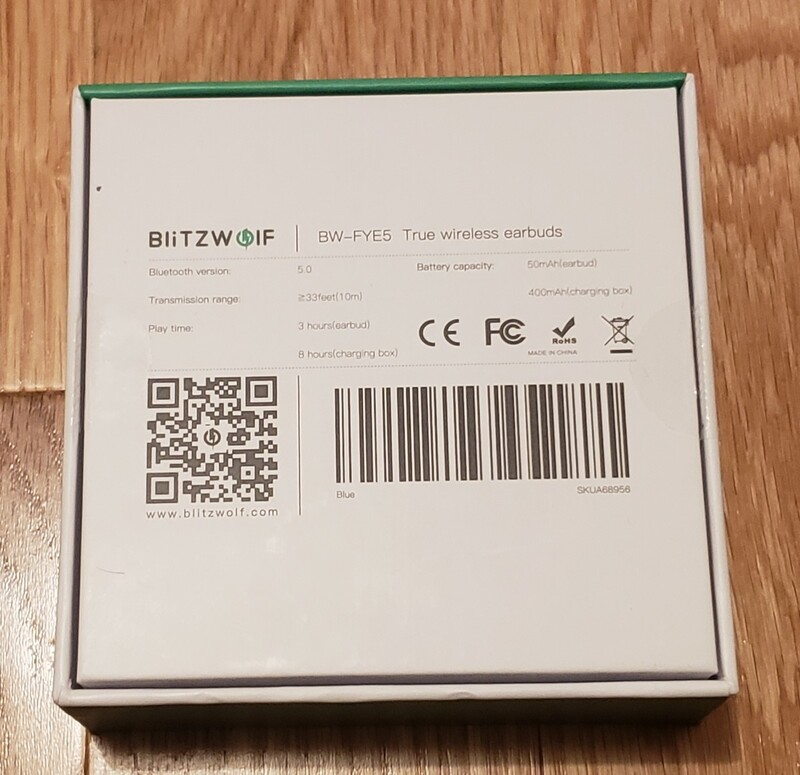 Official site: BlitzWolf BW-FYE5 True Wireless Earbuds. 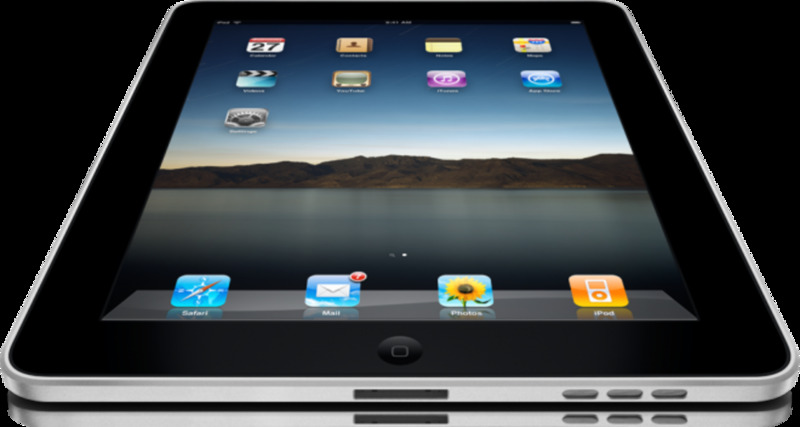 Beginning with the impressive technical specifications, I consider the most important attributes to be the battery life and size. 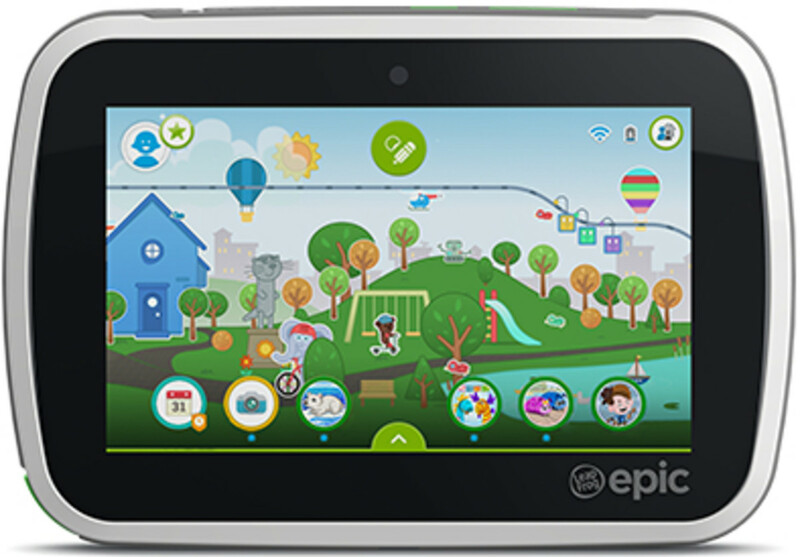 We will take a much closer look at the battery life in the latter portion of this review. As for the size and weight, the capsule remains very lightweight and easy to carry. Drop it in your pockets or a bag and you'll hardly notice it's there. Dimensions wise, the FYE5 is slightly smaller than the FYE1 (original earbuds). However, the battery life hasn't been sacrificed in any way. We will go into more details in the latter half of this review. Pretty iconic now, BlitzWolf retains that minimalistic branding. Admittedly, a little mysterious as well. At first glance, the model is inscribed on the outside of the box. This box accommodates absolutely no pictures or any other product descriptions. Personally, this green and white theme has grown on me. It adds to the mystery and excitement of the unboxing experience. In order to keep the front of the box as clean as possible, much of the critical specifications are listed over on the back. Included on the back are multiple ways to reach out to BlitzWolf for product follow-up and support. It's interesting to note that BlitzWolf included the play time on the box itself. The earbuds offer three hours of playback time. This is bumped up to eight hours with the "charging box". I honestly prefer the term "capsule" and you'll see why in a minute. Something else of interest is the color variant. It lists "blue" by the SKU information. 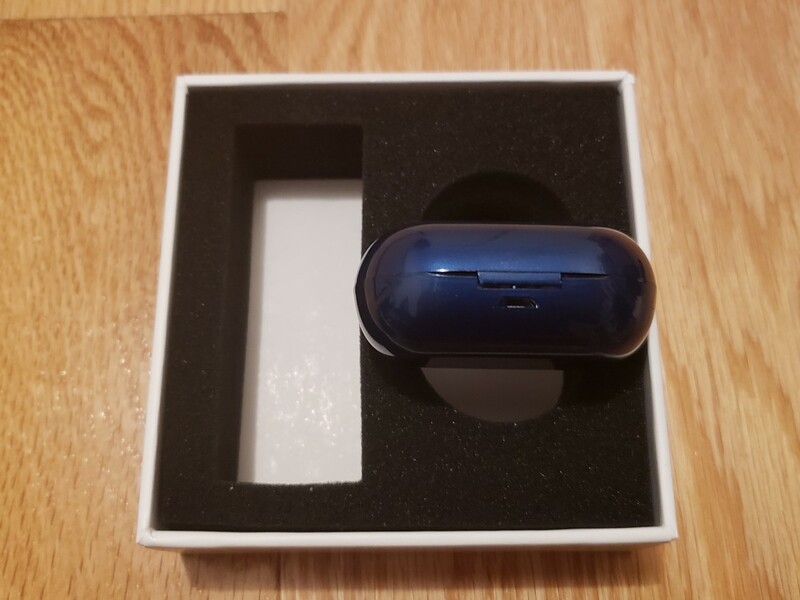 Taking a look on their website, the earbuds are only available in blue at the moment. I do hope to see BlitzWolf roll out more color options down the road. For now, blue will have to do as I'm quite a fan of it. The contents are quite straight forward. Taking the items out of the box, you have your instructions manual and warranty pamphlet. These two items are quite straight forward. They cover the basic operations of the earbuds and list contact instructions for warranty claims. I decided not to take a separate picture to go more in-depth as I believe there is just one critical point to highlight. BlitzWolf has made the warranty period a standard 18 months. If you're used to the typical one year warranty, you'll be glad to see that more and more OEMs are extending it by an additional half a year. The fact that they're willing to go beyond the industry standard shows the confidence BlitzWolf has in their products. From the buyer's perspective, this is definitely an additional peace of mind. BlitzWolf also included a micro-USB charging cable. You will need your own wall adapter to make it work. Along with the capsule, BlitzWolf included a set of ear tips. These come in three sizes. One set of the sizes is already installed on the earbuds. Therefore, you see just two sets in the transparent pouch. The ear tips may look a little different. Unlike the typical black ear tips, these are transparent. I dare say the material is different too. These ear tips are definitely on the softer end. They will conform to your ear canals better creating a seal without the added pressure. 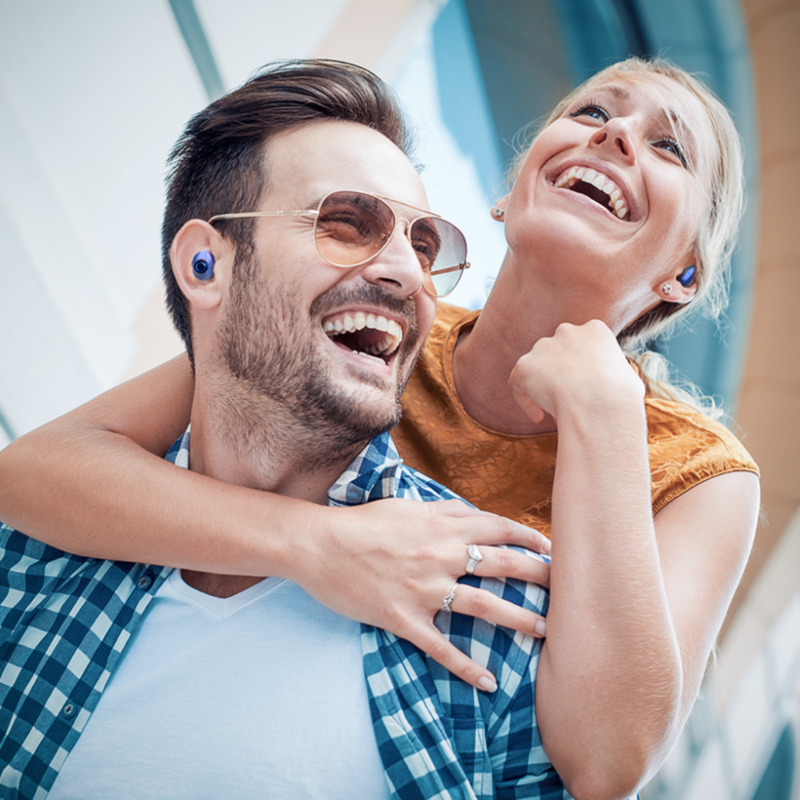 As a result, they will feel more comfortable in your ears. This is absolutely amazing. BlitzWolf made an excellent decision with the color of the capsule. The "blue" listed on the box is really metallic blue. It's glossy and shiny with a hint of color shift. It would be awesome if BlitzWolf releases more metallic color variants. For now, I'm quite fond of the blue. As for the capsule itself, more specifications are tucked away at the bottom and out of sight. The BlitzWolf logo is also facing the bottom. I consider this a very good choice as there aren't any markings on the upper side. On first glance, you'll have the metallic blue shimmer as the ambient lighting changes. The back of the capsule is very straightforward. The hinge is very secure and durable. I have never worried about the structural integrity of the hinge. Just lower, you have the micro-USB charging port. I would've liked this to be USB Type-C. From my experience, the micro-USB port simply isn't as durable. The port tends to wear out faster and this will affect the connectivity. I switched from the FYE1 to the FYE5 as my daily driver. The good news is that I have not experienced the micro-USB port wearing out. My biggest dislike is opening the capsule. Unlike the original earbuds, the FYE5 houses stronger magnets. While the lid is a lot more secure, the groove is quite shallow. I often struggle with getting a good grip on the lid to flip it open. One improvement I hope BlitzWolf makes is designing a deeper groove to make it easier to flip open the case. While I wouldn't say this is a dealbreaker, I would say that you need to use your nails to pry the lid open. This isn't as user-friendly as most other wireless earbud cases, but it's definitely not impossible to get the lid open. Once you open the lid, the actual earbuds are revealed. You can notice that they come in that metallic blue color as well. From a visual standpoint, this is quite an upgrade. The earbuds look a lot nicer compared to the oblong shape of the FYE1. Currently, there aren't any lights on because the earbuds are fully charged. If the earbuds are charging, they will light up. When you begin to take the earbuds out, you will be greeted with a bit of resistance. 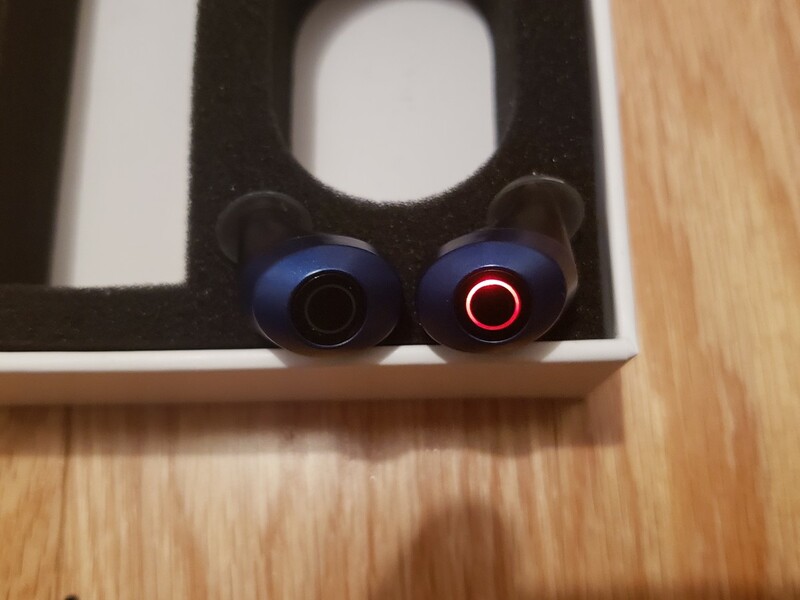 compared to the FYE1, the magnets on the FYE5 are much stronger. This is actually a good thing. Not only are the earbuds held down more securely, but it also makes it easier to find the placeholder when you need to put the earbuds back. When I use the earbuds in bed, there's no fumbling in the dark. The magnets act as a guide to slotting in the earbuds into the capsule. Overall, I'm glad to see BlitzWolf embedding in stronger magnets. As you can see, the right earbud lit up. This one is connected via Bluetooth. The ring will light up in one of two colors. They signal different statues such as connecting and charging. Very difficult to take a picture of this, the lights will flash on the ring. This is a slight annoyance when using the earbuds in the dark. For example, I do not recommend using these at night when watching a movie on your mobile device. The flashes can get annoying when you're trying to focus on the screen. However, they work quite nicely pretty much anywhere else. Personally, I found that they work very well in the gym. When we take a look at the inner view, I will explain why. Finally, connectivity is amazing. I mentioned this in the BW-FYE1 earbuds and I believe it applies for the BW-FYE5 as well. The earbuds pair insanely fast. After the initial set up, pairing is incredibly fast. The earbuds will pair before I even have a chance to put them in my ears. For starters, the charging pins are quite standard. So far, they remain sweat resistant. Combined with the strong magnets, they have no connectivity issues with the capsule's charging functionalities whatsoever. 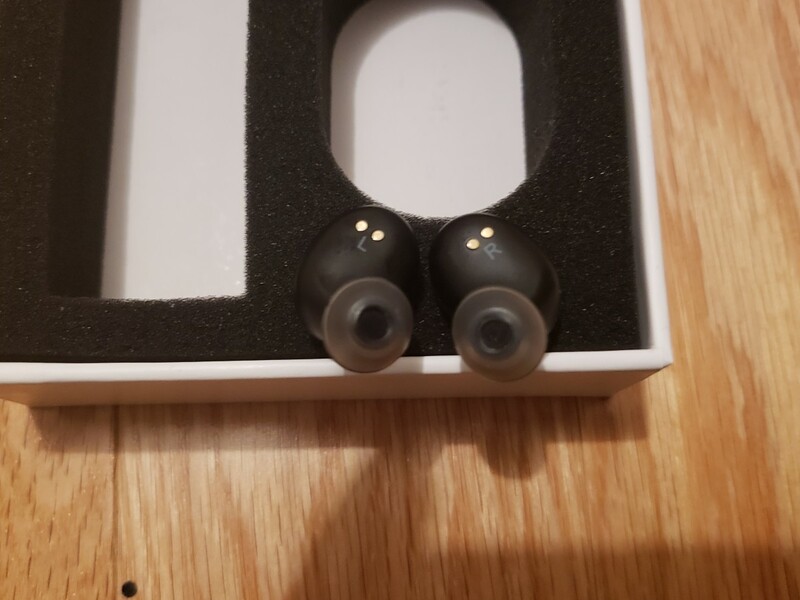 Moving onto the earbud tips, I mentioned that they were quite unique. I do find them more comfortable than your standard black rubber tips. Not only that, they are softer and thinner. As a result, they conform to your ear canals better without building up too much pressure. I was surprised by how thin they are. However, they do an excellent job blocking the surrounding noise. Since they don't advertise noise cancellation, I do not expect anything of the sort. While they don't eliminate external noise completely, they do an excellent job at noise reduction. If I had to give a percentage measure, I'd say they muffle out 80% of the environmental noise. This is especially useful on any public transit system. Whether you listen to music or audiobooks, these earbuds will get the job done. The much-anticipated section of the review. I will split this off into two sections - music playback and phone call durations. Beginning with the music playback, I tested this on my daily commute for work. My commute is approximately one hour each way. Through my daily usage, I managed to average two days per charge. Basically, I would take them out of the capsule and only put them back in when the batteries are completely drained. When I'm not using them, I drop them in the cupholder of my car. Even though BlitzWolf advertises three hours of continuous playback, I managed to average four hours. However, this is a different story for phone calls. After experiencing the 4 hour playback time, I expected similar results for phone calls. However, I could not have been more wrong. During my phone calls, the earbuds died in just over an hour of usage. This seemed to be quite consistent in my week-long test. I can confidently say that the earbuds will average a solid hour for pure phone call usage. Definitely, no complaints here. I mentioned that BlitzWolf's portable speakers are bass boosted. As a result, the sound is a bit off-balanced and unnatural. However, this isn't the case with these earbuds. The earbuds definitely sound natural with a good balance of bass and treble. Additionally, I definitely wouldn't call the bass weak. Given my experience with bass-heavy speakers, these are definitely a lot more comfortable to wear. The quality continues to remain crisp even at higher volumes. I have not experienced any distortions or echoing. These will definitely get the job done for the majority of users. The connectivity distance is strong. If you are within a 10-meter radius of your device, you won't experience any static or cut-offs. I left my phone upstairs and, surprisingly, my music was still playing as I went downstairs. Only when I walked a bit farther away (to the kitchen) did I experience the cut-offs. However, that definitely is stretching the capabilities of Bluetooth 5.0 quite a bit. 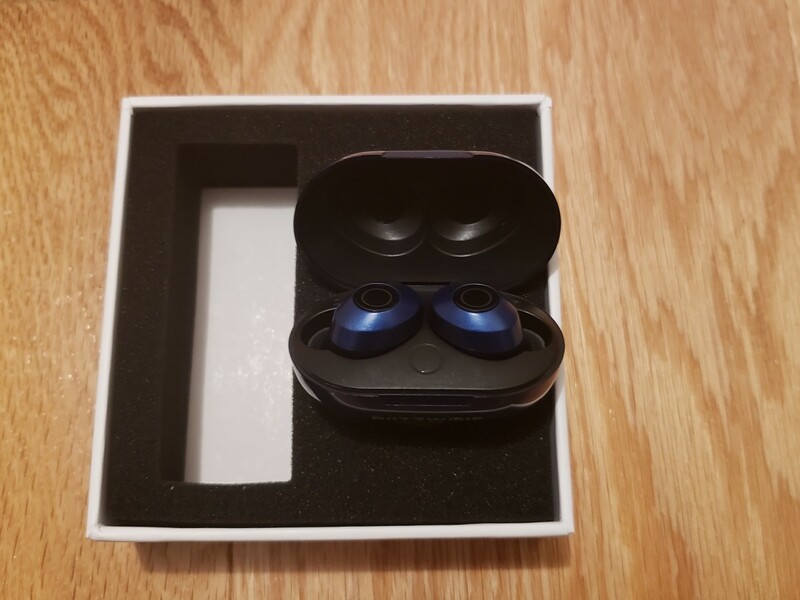 The BW-FYE5 is a significant upgrade from the original BW-FYE1 wireless earbuds. These earbuds simply look great and sound great. The metallic blue will grow on you over time. No shortfalls with the quality, be prepared to be immersed in a balanced yet rich sound. With the silica gel ear tips, you can be sure to balance comfort with noise isolation. However, the earbuds aren't perfect. The groove on the capsule needs to be deeper in order to make the lid easier to open. Instead of using the tip of your thumb, you will need to pry it open with your nail. If any of these points fit your needs, then what are you waiting for? 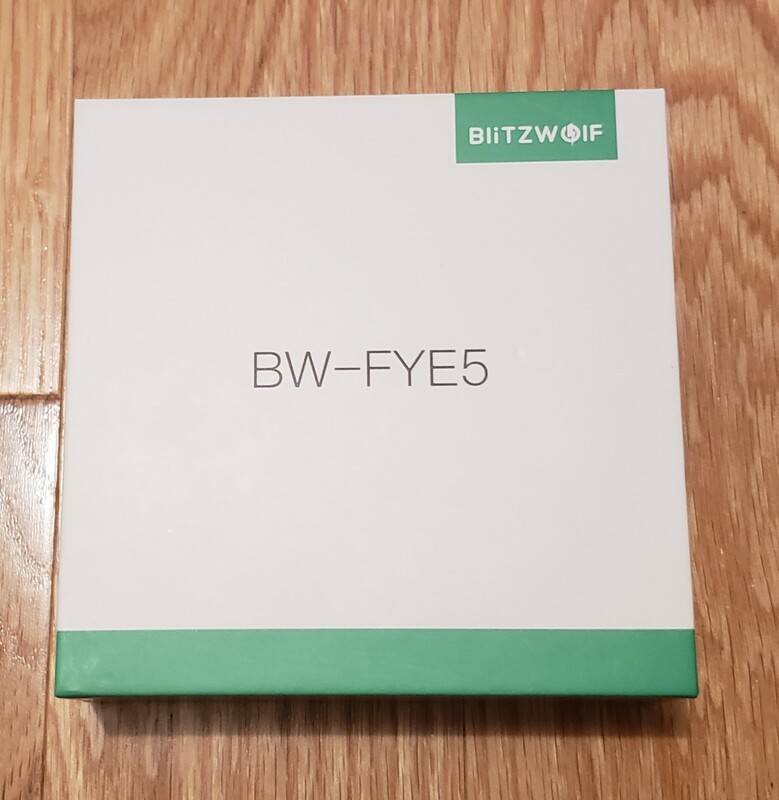 Are you interested in the BlitzWolf BW-FYE5?